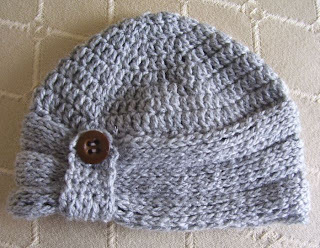 Designed once again by special request for an etsy customer...here is my Knit-look Crocheted Cloche. This pattern is written for sizes newborn up to adult womens. Here is Holland modeling the 1-3 year size hat for me. 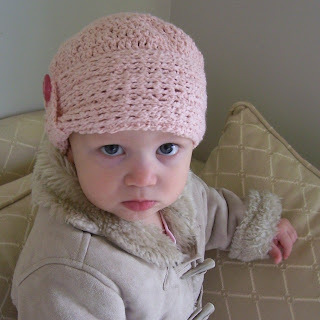 Crocheted in worsted weight pink cotton and accented with a pretty dark pink button. The gathered brim really adds a special touch! are you going to sell this pattern!? It's super cute! Yes, the pattern is up for sale already in my Etsy shop and on Ravelry. You can also buy it by clicking the "buy now" link in the post. Cost for most of my patterns is $4.00 USD. Awesome! I guess I could have actually clicked on the link, huh?! =o) Off to buy it now!